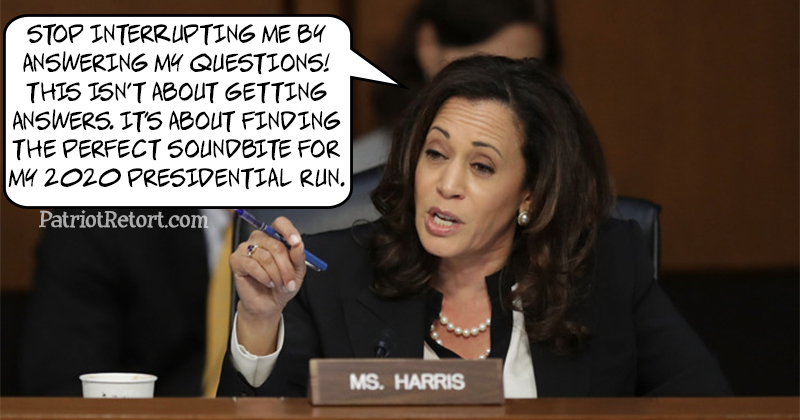 Senator Kamala Harris’s staff has refused to answer any questions regarding the citizenship status of her parents when she was born. The normal path to becoming a naturalized U.S. Citizen takes five years. Kamala Harris was born in 1964. Her father emigrated from Jamaica to the USA in 1961. Her mother emigrated from India to the USA in 1960. Thus there was not sufficient time for either of Kamala’s parents to become naturalized U.S. Citizens. Kamala’s father eventually became a naturalized U.S. Citizen per his bio. It is not known at this time if Kamala’s mother ever became a naturalized U.S. Citizen. She moved to Canada with Kamala when Kamala was about seven years old. It is possible that Kamala’s mother might have naturalized at some point as a Canadian citizen. Kamala Harris’s mother is now deceased. As I said in the first sentence, Senator Harris is not being transparent on this issue and her office staff has refused to answer any questions on this subject. Given Kamala Harris’s year of birth, and her parents emigration years, she was born in the USA to two foreign nationals and thus inherited their respective birth nation’s citizenship when she was born, in addition to being a basic Citizen by being born in the USA to aliens legally domiciled here. Thus Senator Kamala Harris was born with citizenship and required allegiance at birth to three countries. Given the current deliberate misreading of the Constitution, being born here is good enough. Besides, she's somewhat black, so she gets a pass. We've seen that happen before. Obongo laid the trail for the waiver argument. Any political asscrap in the future will be able to claim that the natural born citizen requirement has been waived by not demandng it of obongo. In fact, if President Trump were to release the birth certificate, expose obongo as not being a natural born citizen and VOID EVERY ACTION OF The obongo “presidency” as illigitimate. that may prevent the waiver and save us from a kamila candidacy and future internationalist communist candidates but we are running out of time under this theory.